Presidential candidate Hillary Clinton announced Sunday that her plans to combat climate change as president include installing more than half a billion solar panels across the U.S. by the end of her first term and generating enough clean renewable energy to power every home in America within 10 years of taking office. Clinton, the frontrunner for the 2016 Democratic nomination, announced the goals in a video released by her campaign Sunday evening. Her campaign said the two initiatives were part of a comprehensive energy and climate agenda she'll lay out over the next several months. "Future generations will look back and think 'what were we thinking, how could we possibly be so irresponsible?' " Clinton says as the narrator of a video that features images of children, wildlife, and images associated with energy production. "I'm just a grandmother with two eyes and brain and I know what's happening in the world is going to have a big effect on my daughter and especially on my granddaughter." The video also takes direct aim at the Republican presidential candidates for statements skeptical of climate change. Clinton speaks, the video shows quotes from candidates including former Florida Gov. Jeb Bush ("I'm a skeptic. I'm not a scientist"), Florida Sen. Marco Rubio ("I'm not a scientist") and Texas Sen. Ted Cruz ("There's been no warming whatsoever") and other candidates. "It's hard to believe there are people running for president who still refuse to accept the settled science of climate change who would rather remind us they're not scientists than listen to those who are," Clinton says. "You don't have to be a scientist to take on this urgent challenge that threatens us all, you just have to be wiling to act." Clinton argues that increasing the use of wind, solar, hydro, geothermal and other renewable energy will help prevent as many as 3,000 premature deaths and 700,000 asthma attacks each year. Expanding the installation of solar panels across the U.S. would increase the current capacity to 140 gigawatts by the end of 2020, a 700 percent increase her campaign said. It would be like having rooftop solar systems on 25 million houses across the country. A fact sheet released by the campaign offered a number of federal government initiatives Clinton would implement to help reach the goals, including partnerships with states, cities and rural communities that are leading on clean energy, competitive grants to states that exceed federal carbon pollution standards, awards for communities that make it easier and cheaper to install rooftop solar systems, strengthening grid reliability and resilience, and making it easier to get low-cost renewable energy to market. She is also promising to talk about plans to reduce oil consumption in the U.S. and around the world, improve the safety and security of the existing energy infrastructure, make fossil fuel production safer, and protect the health and retirement security of former coal workers and their families. At an event in Iowa Sunday, Clinton said those who don't acknowledge the existence of climate change are "just not paying attention." Iowa is the second-largest producer of wind-generated electricity in the nation, according to the U.S. Energy Information Administration. Clinton's plan follows one laid out by another Democratic candidate, former Maryland Gov. Martin O'Malley, which promises to end the country's reliance on fossil fuels entirely by 2050 and to double American energy efficiency within 15 years. O'Malley promises an entire nation powered by renewable energy within the 35 years, as opposed to Clinton's pledge to power every home with renewable energy in 10 years. Though Clinton has not revealed the full extent of her policies to address climate change, O'Malley said he would deny permits for drilling off the coasts of Alaska and Antarctic and promises not to build the Keystone XL pipeline. 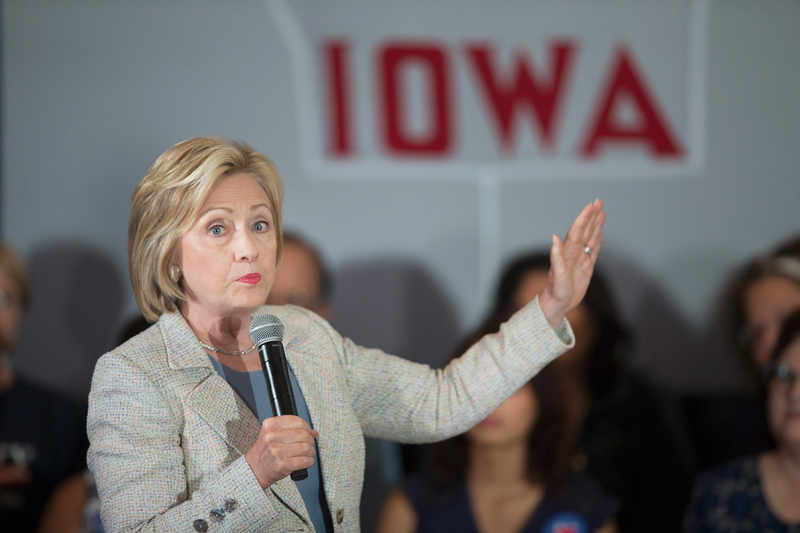 Clinton has not yet said what she would do about the pipeline. Clinton's biggest challenger for the Democratic nomination, Independent Vermont Sen. Bernie Sanders, regularly talks about climate change in his stump speech, describing dire weather conditions created by the warming of the planet. He has not yet laid out a formal plan to combat climate change, although last month he introduced legislation which would provide $200 million in loans and grants for solar panels on public housing and low-income family homes.